Page added in May 2003. Milo and we immediately associate this name to the statue of Venus, found by chance in April 1820 and soon shipped to Paris by the French vice-consul in Milo, Louis Brest.  It is a Hellenistic statue, most likely brought to Milo when the island was a possession of the Ptolomies, the rulers of Egypt from the death of Alexander the Great until that of Cleopatra. 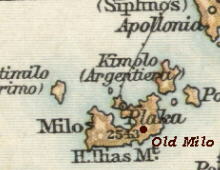 Milo was known for its minerals and for its natural harbour and these two elements are highlighted also in the XVIth century Venetian map shown below. The map shows the site of the salt-works and of the silver mines (on the small island called Argentiera, today Kimolos). 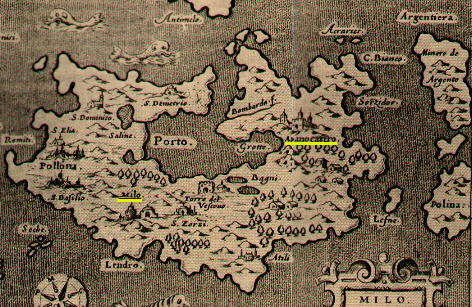 The town of Milo (underlined in the map) during the Venetian rule was next to the inner basin of the island, while the ancient town of Milo was located on a hill controlling the entrance to the inner basin (Castro in the map). Milo has a volcanic origin and this explains its shape. 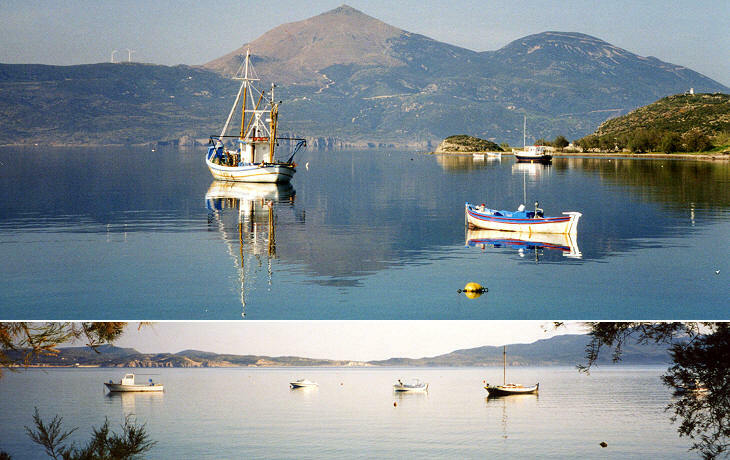 The inner basin is so shielded from the open sea that the water is almost still. It reminds me of the Bracciano Lake. Such a sure haven always attracted merchant and military fleets. During the Sanudo - Crispo rule the Christian corsairs who raided the Turkish coasts came here to sell their loot and have a rest. After the fall of the Venetian rulers the town of Milo was abandoned and the inhabitants moved to the fortress (Kastro) which had been the Acropolis of ancient Milo. 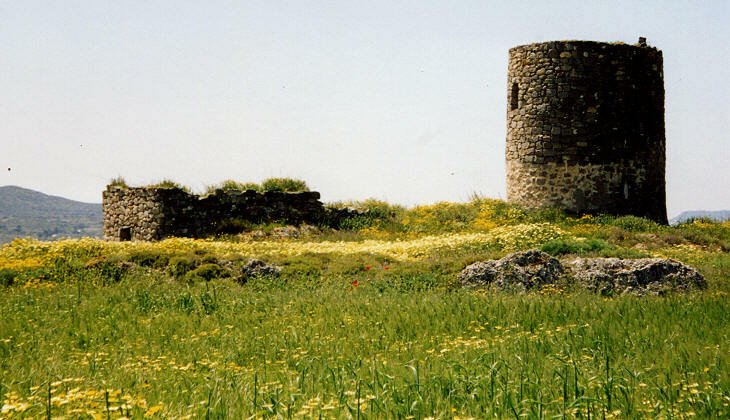 Little is left of the fortifications of Milo apart from this tower. 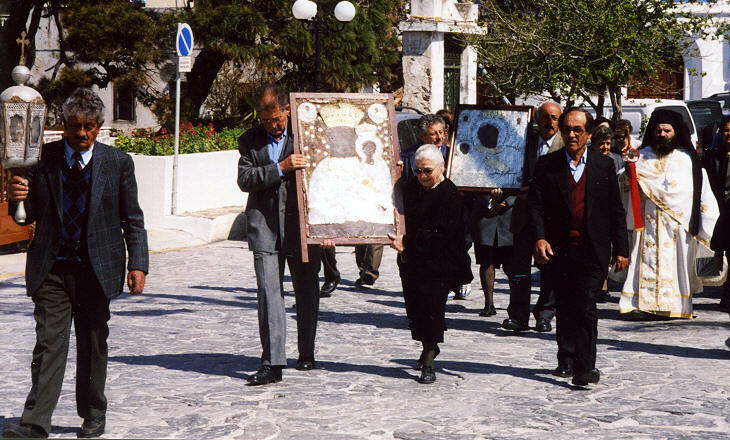 The icons and the decorations of the churches were moved to Kastro with the exception of the church of Panagia Portiani: the name means next to the gate because most likely it was immediately inside the walls of Old Milo. It is actually two churches Assumption of the Virgin and St Haralambos which have been combined into one. 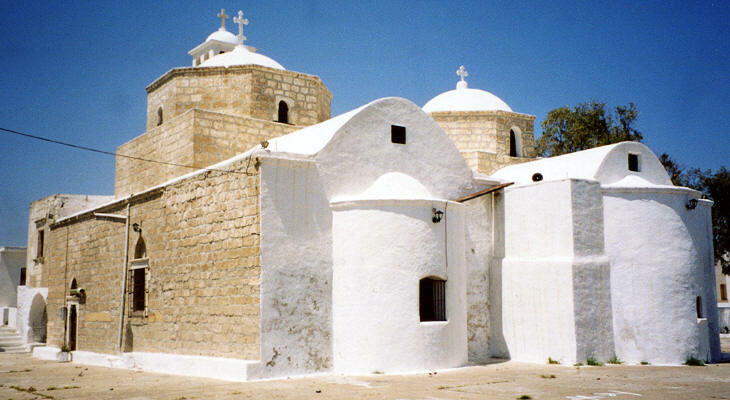 It is quite common to find twin churches in the parts of Greece which had been under Venetian rule. Often one church was Orthodox and the other one was Roman Catholic. Climbing to the top of Kastro offers rewarding views over the narrows leading to the inner harbour. 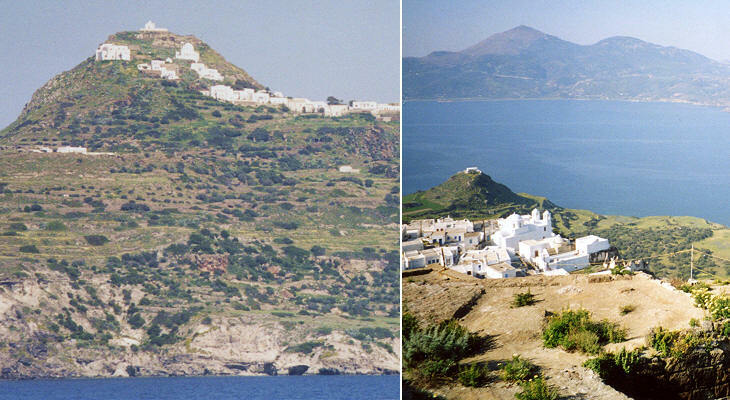 The image to the left shows that the top of the hill is almost without buildings, because the inhabitants of Kastro gradually preferred to settle on a terrace immediately below the Acropolis. 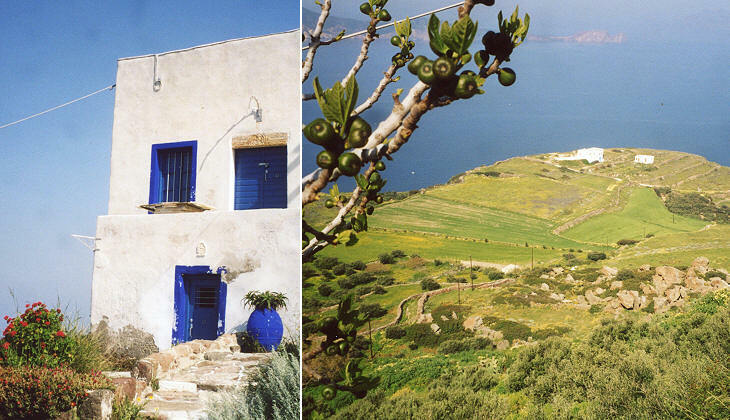 There are very few remaining houses in Kastro. Another reason for this is that during World War II the Germans put on its top an anti-aircraft gun and the site was bombed by the Allied forces. The few remaining buildings of Kastro show some of the reliefs which were brought here from Old Milo, including a coat of arms of the Crispo family. A Holy Week procession gave me the opportunity to take a picture of the icons, which once were in Old Milo. 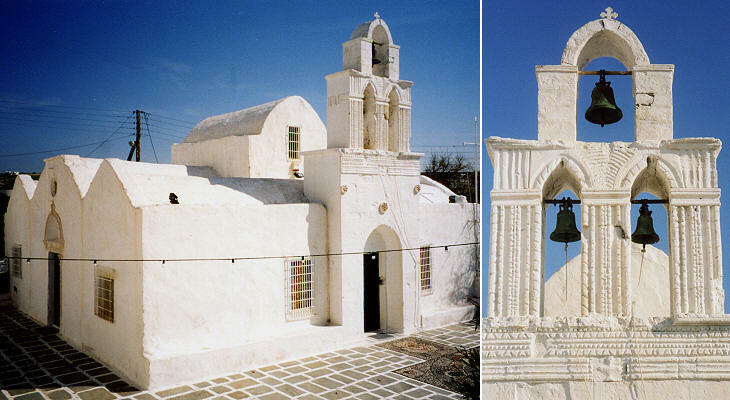 Today there is a tendency to emphasize the "cycladic" appearance of all the buildings: in the case of the old church of Agia Triada in Adamas (today the largest town on the island), the thick white painting hides the interesting decoration of the bell tower. A small stone tower in Adamas has a medieval appearance, but it was built during WW II to provide ventilation to the shelters where the inhabitants had to hide. A French war cemetery brings back more intriguing memories. 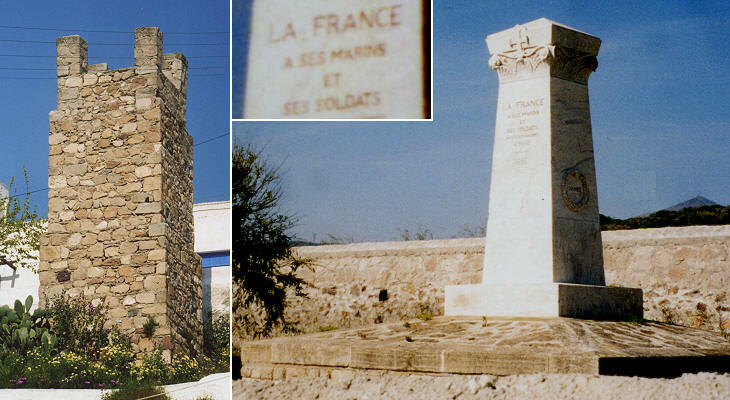 It is dedicated to the French soldiers and sailors who were buried in Milo during the Crimean War (1854-56). They most likely died of sickness or wounds while they were being brought back to France from the battlefields of the Crimea. It was a senseless war originated by a quarrel concerning the Greek and Latin churches in Jerusalem, where the cynicism of the politicians and the stubbornness of the military commanders caused the death and the misery of so many soldiers that eventually public opinion in England and France showed signs of anxiety and disquietude. The celebrated charge of the Light Brigade at Balaklava ended with the loss of 409 out of 607 sabres.